In August, 100 reindeer of the Evenk breed will go fromEvenkia to Tuva. During the visit of ministers of agriculture and animal breeding of Republic Tuva and Krasnoyarsk region to Evenkia, an agreement was reached about sending reindeer to Tuva. According to the head of the reindeer-breeding firm “Surindinskiy”, Viktor Gayulski, a herd of 100 heads will be transported to the taiga zone of the republic for the purpose of improvement of the breed of Tuvan reindeer and to increase their population. As the minister of animal breeding of Tuva Valentin Endan announced, Evenkia will receive 20 Tuvan bulls in exchange for the reindeer. 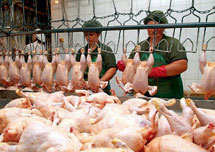 The re-established chicken plant “Yeniseiskaya” started the sales of chicken meat in Tuva. In the 90’s, this enterprise went out of business, among other reasons also because it could not successfully withstand the competition from inexpensive “Bush legs” in the market conditions. After the reconstruction, into which about 150 million rubles were invested, it will supply a significant proportion of the needs of the population in chicken meat. He told the reporters that 6,000 sheep will be purchased in Tuva. Orders are already coming in from various areas of Khakassia. 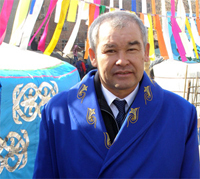 A project of co-operation with Mongolia is being evaluated, which would involve an establishment of a quarantine point in Tuva for sheep brought over from the neighboring country. Nine million of fish larvae o will be released by the workers of “Khakasrybvod” (khakass fish breeding facility) into water reservoirs of Krasnoyarsk region and Tuva. 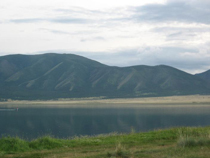 As the employees of this firm informed the correspondents of IA Khakassia, currently the ichthyologists are involved in releasing fish into the Krasnoyarsk water reservoir and into lake Chagytai in Tuva. On April 24, 2009, Flight SL 2037 opened on the route Novosibirsk - Abakan – Kyzyl, which will fly twice a week. 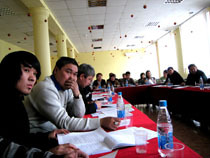 As announced by “FederalPress” in the press service Interregional association “Siberian Agreement”, such an extraordinary event as establishing a new air route in the period of economic crisis was necessitated because over the past few months, practically no interregional flights to Tuva remained active. Evraz Group said Monday that it had renounced the right to purchase the license to develop the Mezhegeiskoye coal deposit, which it won in a hotly contested auction last year, because of weakening market conditions. Evraz unit Yuzhkuzbassugol had offered 16.9 billion rubles ($510 million) to win the right to the license in July, beating out competitors including Oleg Deripaska's Basic Element for the deposit in the Tuva region. Interfax recently cited Mr Andrei Plugar deputy general director of BasEl as saying that Oleg Deripaska's Basic Element held negotiations with OOO Lunsin a subsidiary of China's Zijin Mining Group and Heilongjiang Longxing International Resource Development Group on the joint development of the Kyzyl Tashtyg zinc and lead deposit the internal Russian republic of Tuva. Oleg Deripaska's Basic Element (BasEl) and Lunsin, a subsidiary of China's Sinopec and member of the Zijing mining group, have agreed on the joint construction of a combined heat and power (CHP) plant which will be fuelled by coal mined at the Kaa-Khem strip mine in the Russian internal republic of Tuva, the Kommersant newspaper reported.